One of the number one causes of lack of distance is not striking the ball solidly in the center of the clubface. To do this the clubface must be square to your intended target line at impact. At the Titleist Performance Institute we have the ability through our 3D biomechanics systems to study every aspect of a golf swing. We have more data on PGA tour players golf swings than anyone in the world and by studying the motion of their wrists from the top of the backswing to impact we have found that they do something a little different from most amateur golfers. This little secret keeps the clubface square to the target line longer and allows them to hit more powerful and solid shots. From the top of the backswing the best players in the world put some gas into their game. At the top of the backswing take your trail hand and pretend it is no longer on a golf grip but on a motorcycle grip. With your trail hand you are going to give it some gas in reverse. 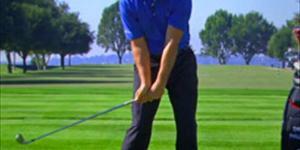 Feel the knuckles of your trail hand turn down toward the ground as soon as you start your downswing. This will give you the feel of closing the face earlier in your downswing, the key ingredient is still to be added. If you turn you knuckles down but don’t keep rotating your body you will hook the golf ball or start the ball well left of your target. If you turn your body but don’t knuckle down enough you will leak it to the right. I want you to get as open as you can with your chest at impact and turn those knuckles down. See the attached swing drill to give you the correct feeling. In the description you refer to the trail hand and I think you mean the lead hand or left hand for right handed swingers. This drill is designed to get you to square the face earlier in the downswing and create a better impact position.